As inventions go, Mecha Washu is one of the craziest... and most dangerous inventions that Washu has invented. The intention was that this android was to be an assistant to Washu, one with her mind data and personality. But somehow, things didn't turn out the way she wanted them to. On the day that Washu was to input her mind data into Mecha Washu, she had shown Tenchi her invention, hoping that he could assist in the transfer. Then the complicating factor entered the lab... Mihoshi that is. The blonde detective didn't initially touch any of the equipment, but a single strand of hair did fall in the device that Washu was to stand in for the transfer. 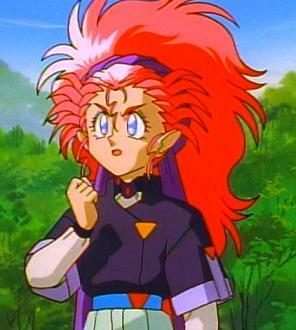 Then after Washu entered the device, Tenchi tried to activate it, but Mihoshi had begun pressing buttons on the panel... with predictable results (a big explosion). Somehow, Mecha Washu had survived the explosion, but a new disaster was looming. It seems that because of the single blonde hair in the device, instead of Washu's mind in the android... it had picked up Mihoshi's mind and personality! There was much yelling and screaming, mostly directed by Washu at Mihoshi, but then it was discovered that the android had wandered out of the lab. From then on, a total fiasco had ensued. 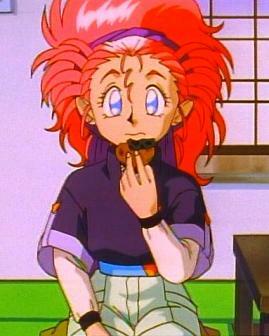 First of all, since Mihoshi was hungry at the time, Mecha Washu had cleaned out the refrigerator. Then while Ryoko and Ayeka were watching a soap opera and a news story of a bank robbery had cut-in, the android... with Mihoshi's dedication to duty in her... wandered off to stop the bank robbers. Of course, the others then intercepted Mecha Washu and tried to restrain her. Feeling like they were interfering with her, Mecha Washu then used the vast weaponry in her body to stop them. No one was hurt, although Mihoshi was knocked-out from a rocket-powered fist. Washu then resorted to using Mecha Washu's self-destruct, destroying all but the head of the android. The head then called... and got the spare body, which didn't have a self destruct, attached it, then went into a tantrum, firing laser blasts in all directions. It was at that time that Kiyone had shown up, looking for her absent partner. After learning the facts (and nearly throttling Mihoshi for her stupidity), the teal-haired detective then formulated a quick plan. She informed Mihoshi that her favorite show, Moldiver, was on. Mecha Washu, also sensing the time of day, then followed Mihoshi in. As the two watched the show, Kiyone, with the instructions of Washu, found the off switch on Mecha Washu and deactivated the android.